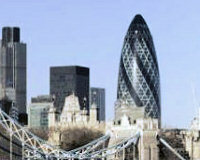 This is the Swiss Re, Gherkin, or plain 30 St Mary Axe. Description: This groundbreaking design is widely known by the nickname The Gherkin, and occasionally as a variant on The Swiss Re Tower, after its previous owner and principal occupier. It is 180 metres (591ft) tall, making it the second-tallest building in the City of London, after Tower 42, and the sixth-tallest in London as a whole. The building was designed by Pritzker Prize-winner Lord Foster and ex-partner Ken Shuttleworth and Arup engineers, and was constructed by Skanska of Sweden between 2001 and 2004.